A lot of our plants seemed to make an effort to open their flowers for Bloom Day, including our first Cal poppy of the year which opened yesterday afternoon. Look at all that sunshine it’s been storing up. We have two kinds of Tazetta Naricssus blooming. I think Golden Dawn is the slightly paler one, Falconet the slightly more orange one, but I’m not actually sure. It turns out that when you buy very similar-sounding varieties, you end up with very similar-looking flowers. 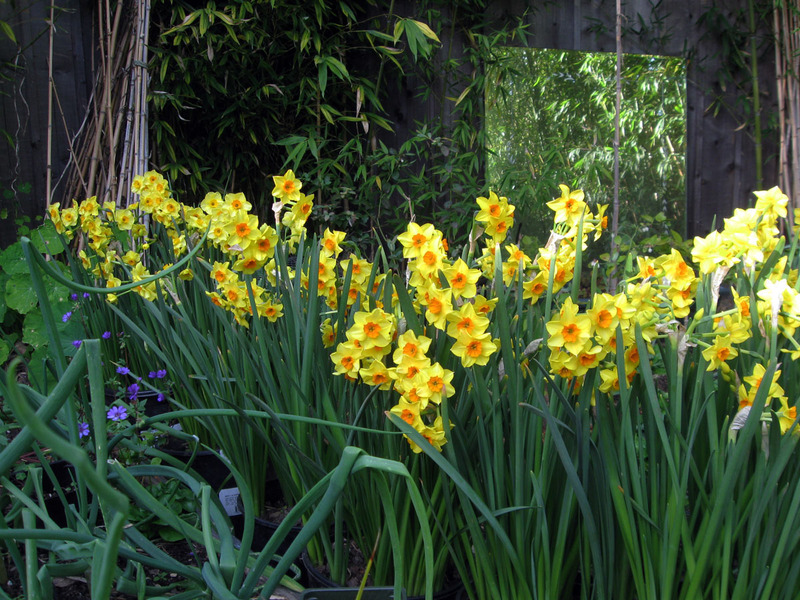 Between them, they have our yard smelling of Narcissus. 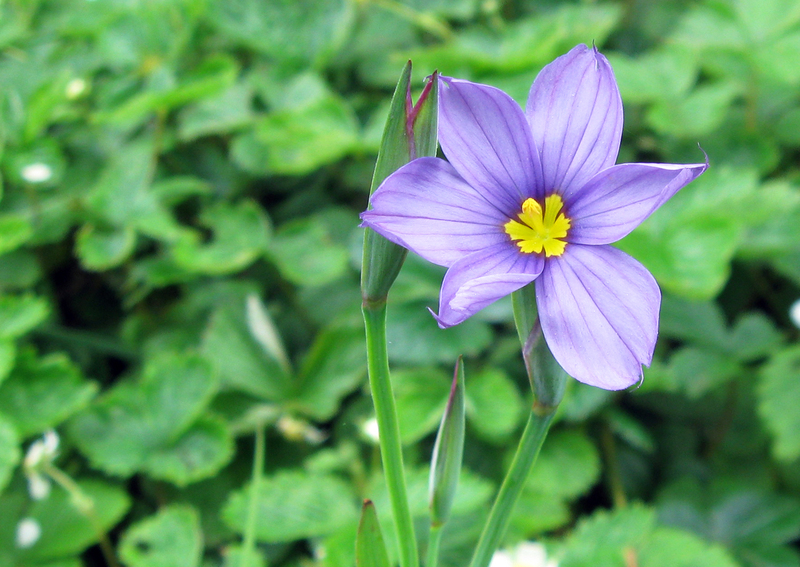 The Blue Eyed Grass seemed to do the California poppy thing, where the first flower from the plant is unusually large and the subsequent flowers are smaller. I have about a dozen throughout the garden. I think they are all blooming at this point. 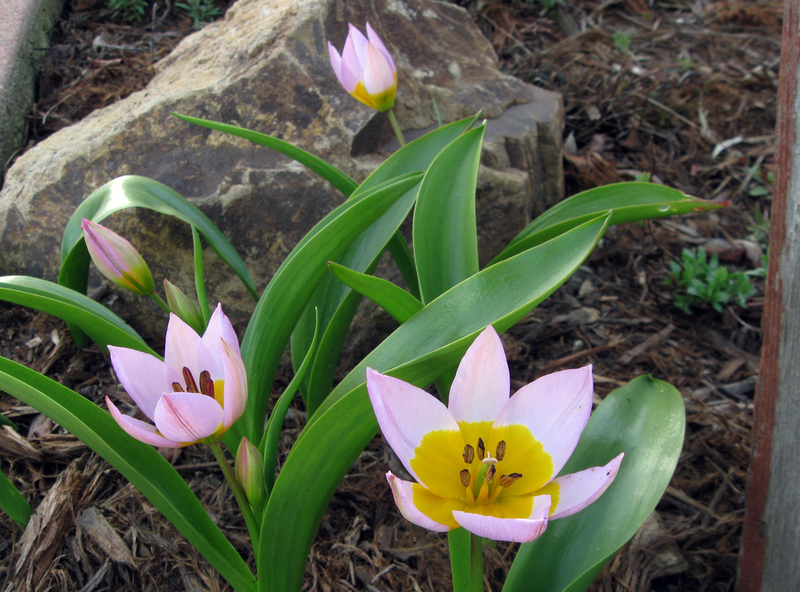 A few of the species tulip, Tulipa saxatilis, have been trying to open for about a week, and then yesterday’s sunshine popped several open. 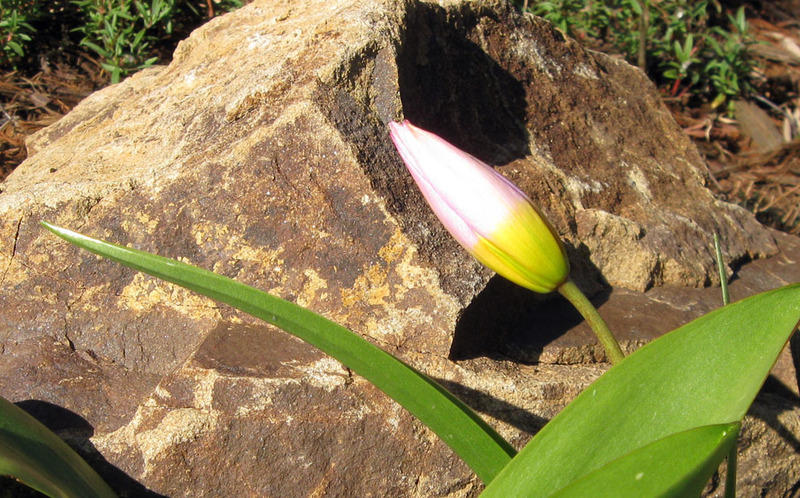 My first time growing a species tulip; supposedly this one will naturalize here. I’m happy with them even if they don’t come back. 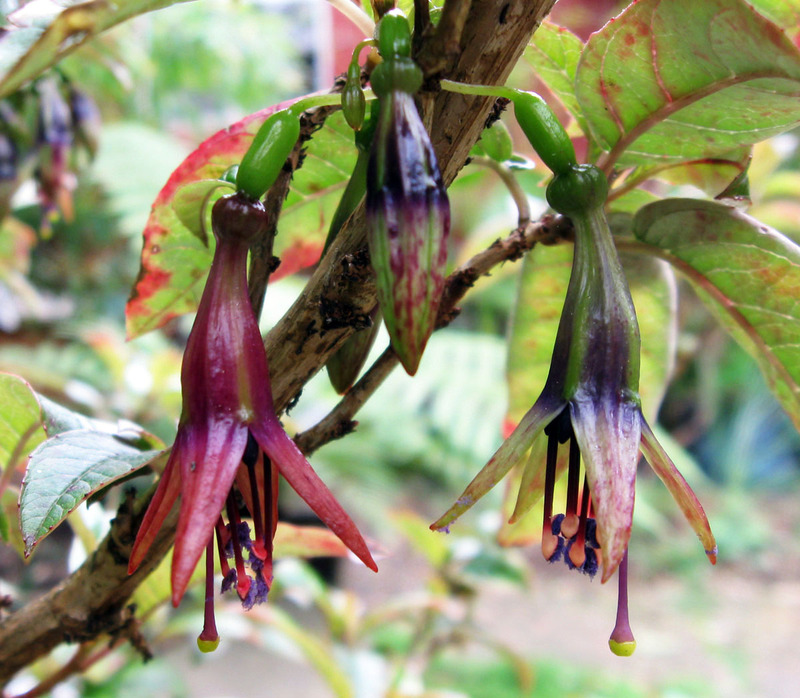 The New Zealand Tree Fuchsia, Fuchsia excorticata, is probably the strangest plant in bloom right now, with flowers that change color over a long period of time. I’d seen them in New Zealand and was curious to see one in bloom, so I bought one a few years ago. Now that I’ve been growing one, I’m still not sure what I think of it. The Heuchera maxima is another plant that opened it’s first flowers yesterday; the hybrid heucheras have been blooming since last week. The ninebarks are budding and about to open, which seems really early for them. The hardenbergia in the background has been blooming for a while, maybe the plant most fully in bloom right now. I’ve been trying to maintain a list of everything in bloom on bloom day, but I haven’t had a chance to do that yet; I’ll probably add it to this post later tonight or tomorrow night (11/21 — it’s now below the fold). The list will be quite a bit longer than last month, as one would expect in the Bay Area in March. My thanks, as always, to Carol at MayDreamsGardens for creating and hosting Bloom Day. Click over to her site for links to about a hundred other garden blogs showing off their flowers. This entry was posted on Monday, March 15th, 2010 at 12:12 am and is filed under garden bloom day, plants. You can follow any responses to this entry through the RSS 2.0 feed. You can leave a response, or trackback from your own site. 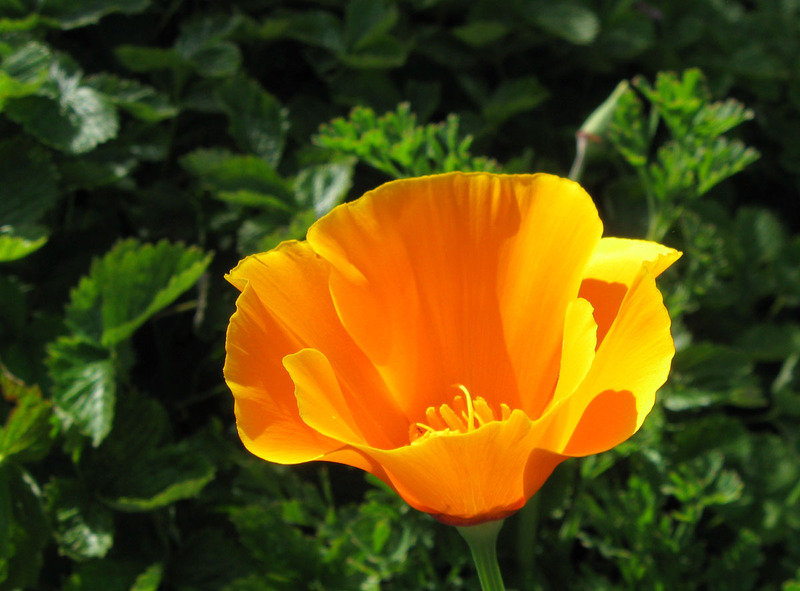 I can’t wait for my poppies to bloom….everything looks great in your gardens. I love your description of your California poppy-“storing up sunshine all winter and is now ready to give some back”-wonderful! 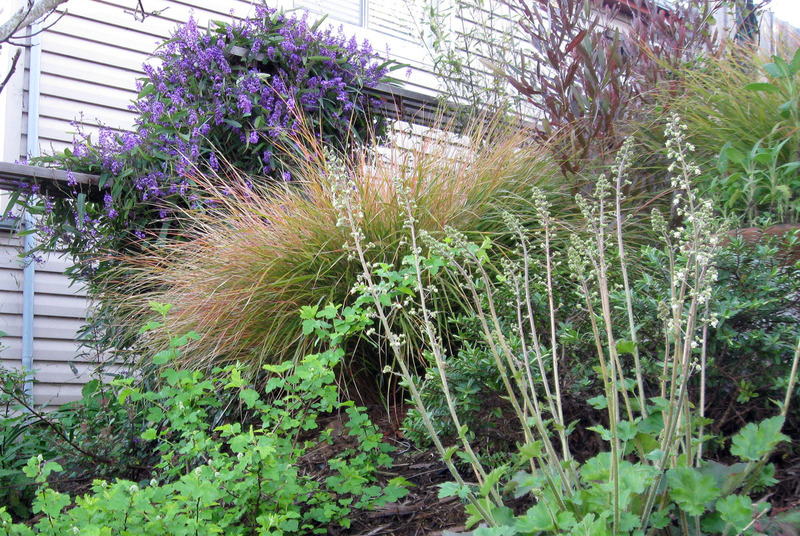 The Hardenbergia and windgrass in last photo are both stunning. i’m in love with cal. poppies…. so gorgeous. Well, and this evening I had 2 poppies! I love them when they first show up in the spring. The species tulips really look like fun as well. Much more interesting than the hybrids. I don’t know the exorcist fuchsia at all. It hardly looks like the tawdry hussies that pass for fuchsias in the nurseries, but I realize there are sorts of species in the genus. It’s definitely different, which is reason enough to grow it as far as I’m concerned. I didn’t get a shot of my Cal-poppy, but I think ours opened on the same day. Get set for a great season of orange! I LIKE the tree fuchsia! Very cool. Save me a fruit..? Most fuchsias are self-fertile and super-easy to germinate. I’d love to try. Did you get it at Strybing? Hmmm the NZ tree fuchsia sure is interesting. If as James said most fuchsias are tawdry hussies, maybe this one is the goth girl from your high school. You know the one. My first poppy just popped today, after I posted for bloom day. They seem later this year. I’ve missed their bright light in the garden. Thanks for the comments. I’m glad to see other people appreciating the poppy and the tree fuchsia. I think Brad and James are right; the fuchsia is not a tawdry hussy, it’s the misunderstood member of the fuchsia family. ‘I’m not garish,’ it keeps telling me when I ask why I have to walk up to a member of the fuchsia family to see if it’s still blooming. Very interesting to watch the flowers change color slowly over the weeks. The California Poppy grows well here in Central Otago, New Zealand. It came here with the gold rush in the 1860s. In those years there was a great wash of people around the Pacific, including the Australian god rushes. Many of the local families here came from San Francisco.